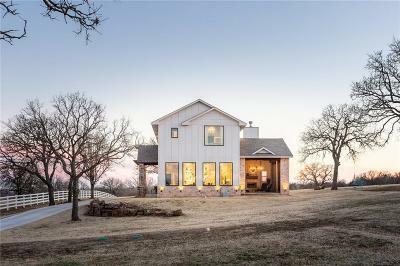 10100 E Covell Road Arcadia, OK. | MLS# 853940 | Oklahoma City Real Estate | Apple Realty, Inc. STUNNING Modern Farmhouse nestled on FIVE Acres, just minutes from Lake Arcadia! You will be blown away by the picturesque views, Unbelievable SUNSETS & absolute privacy. The gorgeous driveway leads to oversized garage w/drive through. Home bursts w/natural light from the oversized windows. Perfectly-designed kitchen has floating shelves, sparkling white countertops, grand island & farm sink. Right off the kitchen awaits the butler's pantry & mud room in the laundry, powder room & office w/built-in desks. Living Room opens to the spacious covered patio w/retractable phantom screens, cozy built-in fireplace, outdoor kitchen & shower! Upstairs features 3 Spacious bedrooms w/walk-in closets & HUGE Bonus Room! Oversized master boasts a giant window overlooking property & unique barn door leading to ensuite. Retreat to the master bath where you will find 2 separate vanities, sit-down vanity, soaking tub & huge shower w/rainfall! 6-zone sprinkler system, Spray Foam Installation, zoned HVAC!